Samuel Johnson said, �The two most engaging powers of an author are to make new things familiar, and familiar things new.� In Ursula T. Gibson�s collection of poetry entitled, The Blossoms of the Night-Blooming Cereus, she does just that. Right from the introductory poem, �Why I Write Poetry�, a rhyming humorous light-hearted piece that captures the essence of why poets are driven to write, Ms. Gibson manages to draw the reader in on a poetic journey that varies in both subject and style, but is always consistently good. A diversity of topics are covered, such as lost love ("Farewell, or "How To Say Good-bye Gracefully"), death ("Why Should I Cry? "), every day, ordinary moments ("Surprises"), and betrayal ("You Lied To Me!"). Styles range from list poems, to rhyming pieces that are easily executed and never forced, to lyrical poems and even a senryu, but Ms. Gibson�s voice remains steady, constant, and appealing, compelling the reader to explore whatever subject or style is at hand. Although well known as the very capable editor of Poetic Voices, it is as a poet that Ursula T. Gibson really shines. Each poem, regardless of form or content, is extremely polished, while remaining seemingly effortless. Readers are left to feel their own sentiments, or explore their own experiences while delving into one of Ms. Gibson�s accounts. Whereas all poems in this volume are not biographical, The Blossoms of the Night-Blooming Cereus is almost like holding someone�s life in your hands, as all good poetry books are. While all the experiences may not be Ms. Gibson�s, the observances and the manner in which she conveys those observances most distinctly are, providing for thought-provoking reading. Ms. Gibson�s frank style speaks well to the topics at hand. Her manner is always light and open-ended in the sense that she never overwhelms the reader with emotion or browbeats with a preachy message. Even when �darker� subjects are covered, there remains a persistently cheerful outlook, a glimmer of something better to keep the reader looking up and never wallowing. The poems that are humorous are particularly delightful and often have a rhyming pattern that makes them even more effective. There is something about this collection that reads almost like a novel, even though the poems are not ordered in a formal manner, nor categorized. Indeed, they are almost representative of snatches of conversation between two friends at the kitchen table over a cup of coffee, if one of those friends were a gifted story teller and poet. I must confess that I did what I never advise other readers of poetry to do: I devoured the book in one sitting, and only then took the time to go back and read each poem over several times more slowly. I highly recommend this book as an excellent gift to others. Because of the aforementioned variety in subject and style, there�s something for everyone. And while you�re at it, don�t forget to gift yourself. This is a book that belongs in everyone�s poetry collection, and begs to be read again and again. 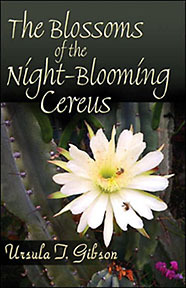 The Blossoms of the Night-Blooming Cereus, Ursula T. Gibson (copyright 2005), 68 poems, $16.95, Publish America www.publishamerica.com , Barnes & Noble, ISBN 1-4137-6482-7. Aurora Antonovic is a Canadian writer, editor, and visual artist whose work has appeared over six thousand times in publications spanning twelve countries and five continents. She has acted as haiga editor for Simply Haiku, Canadian liaison for Muse Apprentice Guild, managing editor of A Little Archive of Poetry, and artist-in-residence for moonset the newspaper. She is the founder and Editor-in-Chief of Magnapoets, a literary magazine that seeks to promote the love of verse in every form. Aurora is a thrice-time Pushcart Prize nominee, and the illustrator of Marie Lecrivain's chapbook, The Painter, available through Lummox Press.